Transcript: In this lecture I want to discuss one of the most important, ah, philosophers who is still working, ah, still alive. Ah, his work ranges over many areas in, ah, social theory, ah, it ranges in areas of philosophy, linguistics and so on. And that’s Jurgen Habermas. Habermas is one of the last great defenders of rationalism in a period in philosophy in which, ah, rationalism is not held in very high esteem. Ah, in many ways, ah, Habermas is an outgrowth of, ah, one of the figures that we discussed last time, ah, namely Herbert Marcuse, ah, and the Frankfurt School; that would include Theodor Adorno and Max Horkheimer. Ah, Habermas was in fact, ah, Adorno’s graduate assistant and, ah, so the original project that Jurgen Habermas set himself was to reformulate the kinds of theories being worked on by Marcuse, by Horkheimer and by Adorno. In particular his first venture was to reformulate their distinction between traditional theory – understood as both philosophy and science, both – as opposed to what they called “critical theory”; a theory whose interest was in the emancipation of human beings. Now this may sound, ah… a little, sort of, “fancy dan”; the whole attempt was an attempt to reformulate Marxism in a setting appropriate for the late 20th Century. So this is a very important school of thinkers of which Habermas is in a way the last and leading exponent. It’s clear, I mean, especially in his later work, that he has moved a considerable distance away from Marxism. That would be obvious, I think, for almost any thinker in the late 20th Century. Ah, what I want to do is to start and move you through in forty-five minutes from Marcuse’s, ah, rather exuberant, ah, radicalism; his youthful radicalism. I want to move from there through Habermas’ attempt to reformulate that project, while keeping in mind our central theme which is The Self Under Siege. I mean, what was important to Marcuse about social systems was not what would be, ah, important to the average economist which was, ah… you know, maximising utilities, what was important to Marcuse about economies and other things was their effect on the lives of selves; how did they cause the self to be able to construct itself. In other words, how it was the economic and cultural impact of that lived out in human beings and I discussed a whole series of pathologies of both the period in which he wrote and the pathologies that have continued down to the present day. So that was… Marcuse’s interest was in liberating people from that unnecessary part of life’s suffering… not death… again, I don’t think we can get around that, but there’s a vast difference between living to be 90 and being well educated and fed and relatively healthy and dying at the age of three weeks and be afro with flies in your eyes. There’s a significant difference there, a difference that people have found worth fighting over and worth dying for. So Habermas attempts to reformulate this project. He begins with a distinction that’s central throughout his early work, between labour and what he initially called “interaction”, which I think can safely be called by now “communication”. And his argument was a fundamental argument. He said if you look at the human species, it has fundamental human interests. One is to reproduce its life through labour, in other words through work. That’s a fundamental interest of the human species, you don’t do that one and, sort of, nothing else gets off the ground. It’s a fundamental human interest. Habermas locates a second fundamental human interest – and this one is… quite different for him – in communication. In other words, in the interest that human beings have – and it’s a deeply seated interest – in communicating with one another. If you think about this, it would be required for everything from any kind of social bonding without which even human life in the anthropological sense wouldn’t be possible and so on. It’s a fundamental interest not just in communication – this is important – but in undistorted and clear communication. That’s our fundamental human interest. Because we have a fundamental human interest in undistorted communication we need to understand what Habermas calls “systematically distorted communication”, and I will be onto that in just a minute. First I want to briefly lay aside the part of the older critical theory and of Marx that Habermas leaves alone as he reformulates his project. The labour half of the distinction is pretty much left over to the standard economic accounts that grow out of his tradition in the early Habermas. Labour is understood as a kind of monological – or instrumental – endeavour. You know, in other words, it’s an instrumental endeavour driven by the imperatives of efficiency and so on. It’s an instrumental endeavour and he defines it as being monological. He also says about it something that is, sort of, banally true. Ah, he calls it a productive endeavour; it’s the endeavour surrounding production as opposed to those surrounding communication. Communication is – according to Habermas – by its very nature “dialogic”, okay. And what Habermas wants to locate, because he knows that there are traditional disciplines throughout the history of Western or Indo-Western, Indo-European societies, of Western Civilisation that deal with problems both in the area of labour and communication. As I say, in the area of labour and instrumental reason we have the sciences, and in the area of communication we have the humanities, which are supposed to enlighten us about dialogue; tell us more about how to talk to one another. For Habermas we really form ourselves as selves in both dimensions, but we could not – for Habermas – possibly become subjects – selves – without the communicative dimension of dialogue. So he would utterly reject, sort of, the empiricist account like David Hume would give, or like Skinner in the more modern period would give, that we could become human simply by looking at patches of blue and listening to pieces of phonetic sounds because for him we become selves in much the way we do for Mead; the great American sociologist, we become selves in our interaction with other selves. In other words, it’s by seeing how other people respond to the things that we say that we cue in on who we are; we may adjust it and so on. I mean this seems to me at one level an obvious point. I mean this seems to me obvious, but you would be surprised; it’s not obvious in philosophy. Now the most controversial part of the early Habermas’ work is his claim that the human race has a third interest – and of course his whole argument will hinge on this – and that’s the critical interest in emancipation; that the human race really has an interest that’s fundamental. By that he means an interest that’s so important that we need it in order to survive; to free ourselves from both the distortions of instrumental reason and the distortions of what could be called – and will later in his work be called – communicative reason. We need to free ourselves from these distortions. In other words, for the human race to survive, we need to learn to labour more humanely to the extent that we can manage that, and in the focus of his early work – perhaps more important still – we need to be able to communicate with one another freely and clearly and that without doing so our chances of a long survival are not great. So throughout this work you can see in a way that we have first a reformulation of a kind of Marxian side of the account of human beings in Habermas’ labour part of the distinction. Now for his communication model we have a – what I would call – a hermeneutic base for it. By hermeneutic here, again, I mean interpretive, and the philosopher he discusses; Dilthey and others, where he says the great art of the humanities, if you will, the way they further communication is through the interpretation of texts. And I’ll be talking a lot today about the interpretation of texts, because in the humanities when you get right down to it that’s what we do. Let me say it in a simple West Texas way: we read books. We read books, we tell our students what they mean, you know, this is what we do for a living. So don’t let “hermeneutics” throw you because it’s a big word; it means interpretation of texts. Now don’t think this is some “fancy Dan” academic exercise. A lot of people have died because they read a book the wrong way. I want you to think of the history of the world’s great religions. One could write a book called “The History of Heresies” and retitle it “The History of Misreadings That Led to Death”. Now I don’t mean to be cynical; it’s just obvious that reading a book and interpreting it a certain way can get you into a lot of trouble. Similarly, those familiar with the law know that just any reading of the constitution won’t work. I mean, ah, “congress shall make no law prohibiting the free exercise of religion”, except if Rick decides – me; if I decide – I want to start a religion of my own that includes, you know, slaughtering innocent babies with Oster knives, in which case my reading of the constitution will lead me into deep trouble. I can support my reading, I mean, the constitution says “no law”; it must mean that. I’ll be literal about it the way that some people are about the bible, I’ll go “no law means no law”, so whatever my religion, be it baby slicing or whatever… but I am afraid that won’t be considered a reasonable reading. In fact I am sure of it, and don’t think that I am suggesting it as a possible religion to any of you out there in the world of video; I am not. Ah, so this is the field of interpretation, but this is not enough for Habermas to have this field of instrumental reason within which science and technology and human labour advanced the world technologically and this, ah, field of interpretation where humanity advances itself through conversations in an ethical and an aesthetic way. There is a third human interest, and this is of course crucial to his argument because like Marcuse and Adorno and Marx and Freud and Nietzsche and all the people that I have discussed; Sartre, he has a fundamental interest in human liberation. The liberation from unnecessary constraints to our freedom and to our full development. So he wants to show where that interest lies and where does it come from. Well he looks around and he can find only one model and its unsurprisingly Freud, because in a way when you reformulate these things you always, sort of, seem to fall back on the earlier models in one way or another; updated, jazzed up in some way. So the model he uses for, ah, distorted communication; that corresponds to what Marx called “ideology”. Those remarks that we make that reflect the interests of classes other than the ones we belong to. Those remarks that we make that are shaped by that truism of Marx – to me – which is that in every age, the ruling ideas are the ideas of the ruling classes. That to me is just a truism; it’s not even a theory, and I think any fair reading of philosophy will bear it out. In every age the ruling ideas are the ideas of the ruling classes. I mean if you read the Nicomachean ethics by Aristotle; it has independent interest, but basically it’s a handbook on how good Athenian gentlemen should be good Athenian gentlemen. I mean, that still is interesting, because people today would probably be better off behaving that way, but what they hell, it still shows the ruling interests and so on. Now according to Habermas, ah, what replaces ideology in his model is what he calls “systematically distorted communication”. Ah, he doesn’t give many examples. This is a really bad habit German philosophers have; is to make complex arguments and then not give you a damn example – one – so you are just lost wondering “what is he talking about?”. Well I think he has in mind blocks between communication, ah, that… for example, ah, you are having a trade union meeting – let’s use Solidarity for an example – that ought to tickle people in America, even though if we had an organisation like Solidarity in America it wouldn’t tickle us, but since it’s over in Poland I think we can praise it. I mean, you know, trade unions… one of the funniest things I ever remember is Reagan praising Solidarity and then I thought: well I wonder how he would like a trade union that large in this country, with those kind of demands… I don’t think he would have been praising it. But in any case, let’s talk about a dialogue among them, and it doesn’t have to be otherworldly; it can be the kind of dialogue you could have among any trade unionists. Well, you know, it’s a “right to work” state, so we don’t have a chance. Well for Habermas, this falls under the model he wants of systematically distorted communication, because it’s sort of a flat statement, it cuts off debate, you know, and debate needs to go on. Moreover, it passed that famous test of ideology, and that’s when you ask yourself if what you believe is in the interest of other people for you to believe it. In other words, I always suspect a belief, if I hold it, and I go: well, you know, the very powerful would love for me to believe that, maybe I should rethink it, because I don’t know exactly where all my ideas come from. I have an idea that many of them come from the people who control the means and the dissemination of information and communication. Okay, so he looks for a model where systematically distorted communication is overcome and he finds it in Freud’s practice of symptoms. Of removing symptoms in the situation between an analyst and a patient, and in that situation what you get is not an interpretation. In other words, the patient doesn’t say something and then Freud interpret it, right? The patient just babbles on and on and on and on and on. This is not a normal interpretive situation. There are a couple of differences. Unlike trying to read a text, it’s a situation where the goal is practical. In other words, it’s to cure the person, to stop having the symptom. So it’s got a practical goal. Interpretation frequently will not. Another difference that, ah, is very important for Habermas is that Freud succeeded – to a certain extent – in developing a practice that did remove blocks to communication. Okay, you have your patient babbling away, sort of, the “talking cure” style of revolution is what we have going here. You have got your patient babbling away and the only way you can bring this analysis to a conclusion is when the therapist intervenes, presents a possible interpretation, but it will not work until what happens? Both parties agree to it. In other words, it won’t be your analysis until you go “Yeah, I keep biting people because…” and then you go “Uh-huh”, and when you and the therapist agree, you have then all the, sort of, confirmation that your previous behaviour and/or communication was distorted. It was distorted. In other words, now you need some kind of account of communication undistorted. The reason is that our communication is nearly always distorted, have you ever noticed that? Take a transcription of any conversation and you’ll notice that there are gaps in it, misspoken words, misunderstandings. The materiality of language is filled with these anomalies and with these mistakes. And I even have to say, along the Freudian dimension, ah, certain sexual jokes and so on… many, sort of, what you would call distortions of communications appear along other dimensions besides just the dimension, ah, that would reflect on human labour for example; many other dimensions get distortions as well. Habermas here… and this is a bold thing for him to do… I want to point this out. In the late 20th Century, after all I told you was going wrong, and after what looked like the destruction of reason itself in just, you know, in a society of subjects that have become, kind of, humanoids; it is quite a valiant thing to try to defend human reason, you know, in any form and he does try to do so in this limited form. He wants to mark off a sphere of undistorted communication that could serve as the basis for a concept of what he calls “communicative rationality”. Now before we get into that argument, I want to explain why he does that other than what I have already said; other than the reasons internal to his early work. He wants to do it to untangle the entwinement I talked about last time between enlightened thought and barbaric action that we have seen since the history of modernity. In other words, we have seen on the one hand people making these individually monological instrumental decisions based on instrumental reason leading to these horrible paradoxes, and for Habermas the trick is not, ah, to give up on modern life. It’s not to fall beneath the level of civilisation reached by capitalism. The trick is to disentangle enlightenment from terror, mythology and barbarism; that clearly we haven’t succeeded in doing in the 20th Century. That’s why I have spent a lot of time in the first four lectures – or some time – discussing the experience of Fascism and its effect on the earlier thinkers we talked about. Because Fascism was the proof that enlightenment and technology had not led to the liberation of human beings as the great philosophers of the enlightenment thought it would. Instead it had led to Dachau, and this was not its destination. This was not… the destination that had been hoped for it. You know, the 19th Century believed in progress. Adorno once cynically remarked “There is no history that leads from slavery to freedom, but there is a history that leads from the slingshot to the megaton bomb”. So what Habermas wants to do [laughs] is to try to find a way to disentangle the more distorting, barbaric aspects of enlightenment from those that we clearly want to hang onto. In Habermas’ opinion there had been advances in modern life, and I don’t think anybody would dispute this. The advances in modern life include one this simple. It is much better to have a toothache in 1993 than in 1493; that’s simple. Whenever anyone asks me about this, I go: well there’s one. In 1493, a toothache, if it’s bad, you know; impacted, it’s the end of your theoretical work, it may be the end of your life. You get one now, you go to a dentist, that’s better! Not everything that modernity has produced has been a disaster, obviously. I mean this is an obvious point. So the trick then is, as it were to, ah, not throw out the baby with the bathwater… not throw out the advances of modernity when we are in the process of trying to clear up these distorted communication forms, and these distortions to people’s ways of life, okay. That’s the trick. When you utter a sentence, Habermas says built into that utterance, into that communication, as one of its conditions is the desire for unconstrained understanding. Now you don’t, when you say “pass me the salt” bring to mind a desire for universal unconstrained understanding, but he thinks that it is built into the structure of languages; the desire to understand one another, the desire to have clear communication. He begins to lay out a series of conditions – which time will force me to just run through very quickly – for such communication. One, and this, of course, is what I like to call the quality provision. Undistorted communication would have a symmetry condition. Truly undistorted communication would have a symmetry condition like this. Everyone would have an equal opportunity to talk and to listen. Everyone would have an equal opportunity to talk and to listen. Let me try to explain why this is more politically interesting than it sounds. It means everyone has an equal right to command as to obey; that’s a speech act, that’s a communicative act. It means everyone has an equal right to question and to an answer. This symmetry condition has more political power than it seems at first. It is a very egalitarian principle. Habermas believes that we couldn’t have undistorted communication without it. Now again, he doesn’t, but I’ll try to give you some examples to make it understandable. I know as a teacher that it’s an important condition, but it’s impossible to achieve in a classroom under these current social conditions. Because I have the power to grade a child and give him an “F” and keep him out of law school, even if his rich daddy sends me 500 letters. Because I have that power, I can’t expect that student and I to communicate in an undistorted way, because our communication is distorted by my power to judge what the student says. This is why the people who run operations – bosses – seldom get the undistorted truth about their situation. I also think – being a husband – that its why husbands seldom get the truth about the relationship they have with their wives and their sons and their daughters and so on, because when you are in a relative position of power, the other person is aware of it too, and of their role, and you cannot expect an undistorted communication, one not… and I again, don’t mean personally, but systematically distorted. This is systematically distorted; it’s distorted by relations of unequal power. If you are to be communicatively rational, everyone has to have the same right to speak and be heard. I also need to give you a real world example of that, and that would be something like the great early meetings of Solidarity. I mean, Lech Walesa recognised people, but anybody could stick their hand up; union member or not. That was when they had crossed the line into a total revolution and Lech Walesa, sure, he was recognising people, but everyone had a right to do that and it wasn’t always him either, even though that was the way it was presented in our media. And that is, while not perfect, and we are not expecting the world ever to be perfect; neither is Habermas. This is a model of communication that is what you would call dialogic; you are dialoguing now, you are not monologuing. You may notice that this is based on a quite ancient idea; it’s a Socratic ideal. When Socrates argues with an interlocutor he never pulls the argument that, well, I am more powerful than you, so you are wrong. As a matter of a fact one of the charms of Socrates is that he owns almost nothing and has almost no position, and the only force he expects you to recognise is the force that Habermas says is the only force a free human being can ever recognise, and that is that peculiar, strange unforced force of the better argument. Habermas believes that much in rationality; that we can change our minds if we hear a better argument, and a free person can do that without being ashamed of himself or herself. You know, if you are in a free and equal situation of communication and someone convinces you through a better argument, you go: “Well, I now believe differently”, but not through distortion or anything, but through just that strange force that a person feels when they become convinced. They go “Oh gee… now I agree with that” That is the force that a free human can recognise, according to Habermas. Okay, another condition, and these are obvious conditions… obvious… I mean, each one can be disputed, and I will discuss philosophers later today who dispute everything I am saying now, but I want to present Habermas’… – since this is one of my main areas – I want to present his position as powerfully as I can. Habermas also thinks that in various dimensions we try to communicate in certain ways. For example, while we do occasionally lie, it belongs – to Habermas – to the structure of, say, instrumental reason in the sciences, that when we contribute to a discussion on that topic; about what’s in the world, what entities there are and how they behave, that we try to make our contribution to the conversation one that is true. [laughs] Now this is a, sort of, linguistic reformulation of a Kantian postulate, but no, I mean, in a way it’s a piece of good advice, I mean, if I was to say, you know, “How should you talk?”, well, try to be relevant. There’s a relevancy conditional, you know, built into speech. This is… Habermas gets some of this from Grice, and I am adding a little as I go along. Make your contribution to the conversation relevant. So if you are at Lech Walesa’s trade union meeting, don’t start discussing Harrison Ford‘s latest performance compared to Arnold Schwarzenegger; it’s not relevant. So try to be relevant. Two, try to make your contribution one that is true; doesn’t mean you will, but try to. Try to make one that’s true. Ah, another condition built into what Habermas has now begun to call “the ideal speech situation”… the ideal speech situation… well why ideal? Well, because he realises this is an idealisation; that human beings won’t be able to fully carry this out, but to the extent that we can, we will be engaging in communicative reason. Try to be relevant, try to make your contribution one that’s true, and C, this is obvious to me too; try to make your contribution one that’s sincere. When I think about that I always think about an article written in philosophy, that is a brilliant article that would be praised by all my colleagues, but it ended with the sentence “Oh by the way, I am only joking”. In a way that one sentence would undo the whole article. I mean, it would be like no matter how good the article, someone would go “Well, what a joke, I mean this guy’s a clown…” No, the idea here is that when you contribute to, ah, what’s called a reasoned conversation that we expect – humans expect – a contribution to be a sincere contribution. [coughs] And let’s see… the final one is a moral condition, and that’s that we expect that you try to make your contributions to language ones that advance the cause of what is right. Now there is no theory here of “right” other than ones you just heard in the communication theory itself. It would be wrong to be insincere; it would be wrong to, you know, lie, it would be wrong to violate the symmetry condition, it would be wrong… and so on. In fact this is a quite thin moral theory but come to think of it, when we tell our children: “Look, you ought to do this”, what stands behind our “ought” is something implicit in language. Namely, that our children can depend on us sincerely telling them a moral truth. This is what before… you know, earlier I said we don’t learn our moral theories from philosophers, I didn’t mean in this sense Habermas is talking about because we do learn it in this sense. Habermas means that when mothers tell their children or fathers “Don’t lie”, they mean it; it’s not distorted. They mean “Don’t lie”, or don’t whatever. This is the ethical, as it were, dimension of language. Okay, ah, well, it looks like we have replaced Marx now by ignoring the economy, which wouldn’t please any of the coal miners in West Virginia [laughs]. Tried to replace it as a way of understanding ourselves in the world, and we have traded in the class struggle, which Marx took to be the, ah, driving force of history for Freud’s talking cure. Well there are some obvious, ah, criticisms raised by Young Turks like myself in the early phase of his work; namely that the class struggle is not, ah, psychoanalysis writ large. The reason it’s not is because workers have every reason to believe that their bosses are not prepared to engage in a process of undistorted communication with them. Now a patient may believe about his analyst – or her analyst – that they are prepared to, especially at those rates. As Freud said, if you don’t pay you don’t get better. But at those rates… ah, you know, you could expect some sincerity and some give and take, but we have no reason to believe the class struggle is a kind of psychoanalysis writ large or that the struggle of human beings over ethnicity, or that the struggle of women to find dignity and equality is some kind of [psycho]analytic process writ large. Habermas is aware of these objections and responds to them in several ways. The one that bothers him the most is the following; that his model is elitist. His model of communicative reason, which I have counterposed to all these pathologies to which it is addressed. When I mentioned all those pathologies that the young people I know have and, ah, you know, anomie; in other words meaninglessness and anxiety, dread and so on. We mentioned all of those, well those are systematic distortions of communication that come out in the way they talk and interact and the theories addressed at those. But here is the problem. It’s not just that this doesn’t reconstruct Marxism – which is of little interest if its not a true and interesting theory of the present age – the deeper problem is that it looks like an elitist theory; it looks like a theory that trades Marx’s analysis of society as a giant factory for an analysis by Habermas of society as a giant seminar room. Have you noticed how all these conditions are the ones that ought to hold in a seminar? Everybody in a seminar should be relevant, concise, sincere, and make their contributions true, and it’s not lost on any of Habermas’ critics that he spent his whole adult life as a professor [crowd laughter]. So this is… now. I don’t want to just stomp on him with one of these West Texas ad hominem arguments here. Habermas responds in a way quite movingly to this objection. He says you have missed the point because what I am talking about in communicative rationality is a process of enlightenment that includes all; janitors, cooks, everybody. It includes us. It includes everyone, so we have missed its universality, but more importantly – and I think that this is a beautiful quotation from Habermas – he says “In a process of enlightenment there can only be participants”. No analyst and patient. So in that way the model was misleading originally. No Lech Walesa and the Led, no Clinton and the Clintonians, no Ross Perot and “United We Stand America“. In a true process of enlightenment there can only be participants. Now that… stated that way, Habermas’ communication theory looks like a linguistic variant of anarchism, and I like it [crowd laughter]. Because it means that everybody gets a chance to talk; I enjoy that. So, ah, now let me, in the time remaining to me here, let me move a little further along to how he has reformulated the theory; and he has had to under the force of various objections. Ah, and they have come from all kinds of people. I gave you the Marxist style objections, but hermeneutic – or interpretive – people in the humanities didn’t like his account of the humanities as limited either. In other words they didn’t like that account as limited to a single interest because they pointed out something that’s come up in here several times, and that’s that the sciences are also interpretive. And they went look, the work of interpretation isn’t just for us humanists, but everybody interprets. I mean, it was Galileo that said that the world was like this giant text and mathematics was its language. Well the analogy of the world as a text is one that’s very familiar to scientists; to read, as it were, and interpret is not something that is limited to books alone. Interpretation, in fact, may be one of the fundamental conditions for selfhood. One of the problems of the current situation, with what I have called previously “information overload” and complexity may be the difficulty that it gives us in interpreting everyday life situations. Because everyone whether they know it or not is always already an interpreter. When you stop at a stop sign, you have interpreted something already. Now you have done that without too much interpretive work. Red – in our country – means not only commie, it also means stop. You know, I mean, red means commie – to me means commie anarchist hippie type scum – but it’s also – when it is a light – means stop. Ah, acts of interpretation go on constantly all around us in all forms of conversation… as it were, in our encounter with the world itself. We see some smoke down the road; we have to interpret: “Is it a wreck? Do I need to go another way?”. Ah, people who have lived together a long time and think know each other well are still constant interpreters. My wife will see a certain look on my face and it’s interpreted, and I don’t think correctly, but she just goes… and then we are off on something, you know? I mean, this shows the ubiquity of interpretation in human life. I mean, in a certain way, one of the characteristics of what the self is, and one of the reasons it’s under siege, is we are interpretative beings. And now, by the late 20th century, we are in a situation where interpretation has never been more difficult. Never been more difficult. One can… I mean, I can name artefacts that we have developed technologically that are almost completely closed to interpretation, and I’ll name one – although we attempt to interpret it – television. 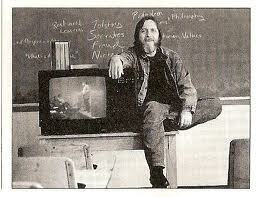 Television tries to interpret itself to us, bypassing the upper brain functions and directly feeding into our minds. This is why I said – off camera between classes – that Orwell was a pie-eyed optimist. 1984 arrived in sort of the early 70’s, and, ah… Orwell’s vision of a horrible future which was a boot stomping on a human face forever is a utopian image because he assumed there would be a resistance and human faces; both of which may turn out to be false. So, I mean, 1984 is not a book that scares me… anymore. I mean, it’s… again, last time I outrageously said that Herbert Marcuse was the Norman Vincent Peale of the 60’s, and now this time I have been forced to say that Orwell was an optimist… you know… it’s sort of my corollary to his little cautionary tale. Well, in the face of all this, I think that the tribute I want to pay to Habermas and what interested me about Habermas’ work was to try to defend reason in spite of all of these things that I have said. You may notice that I gave an account of cynical reason, but I didn’t give you an account of how I might stand vis-a-vis it, and I have said a lot of cynical things. Well, what I admire in Habermas is the attempt – without being a complete idiot – to try to develop an account of reason that runs against cynical reason. It does say to us we can speak to one another, we can have processes of enlightenment, we can learn to say what is true to one another. Now, it is true that this is endangered in ways that he didn’t discuss in his early work which he does discuss in his later. His later work, especially a very large book called, ah, “The Theory of Communicative Action“. Ah, Habermas once again returns to the attempt of defending his idea of communicative reason and he adds many more problems to it. First he recognises something that I have already pointed out; which I think he always recognised, but again, in typically German intellectual fashion he needed time to write a 4000 page book on it. In my book when I gave an account of his book, I did it in 31 pages, and people said “Well, that’s too short” and I went “No it’s not; his is too long”. Thanks for the upload. Just a heads up, you have 3/5 listed twice before the final 5/5 lecture piece. Is anyone still there now after 8 years?! Just wanted others’ thoughts on the relevance of Rick Roderick’s highlighted Habermasian points and his (RR’s) assessment of late 20th century society. He’s just phenominal. What a loss that we don’t have him here to listen to his take on our world in 2018. He’d be so spot on, but certainly sad. I wonder about this too. He’s an interesting case because he is pretty much as left leaning as it gets, especially with regard to sympathy for the plight of the disadvantaged, however he was no fan of political correctness. Yes, for US a leftist. For Europeans, for example, a competent observer of society. He woukd have been a Bernie supporter, don’t you think? His unbridled down-home Southern straightforwardness is refreshing! I’m in Germany right now doing research on my Habermas-based thesis (communicative action). Btw, Monday is Habermas’ birthday. I think RR will be at his party in spirit. I can tell you Rick was a big supporter long before Bernie even considered running for president, and my brothers and I certainly put our votes in for Bernie. Obviously I can’t speak for my father, but I would argue that his response to the current state of politics wouldn’t consider the modern idea of political correctness as a leftist issue. I personally believe what we call the left, in the democratic party, is dominated by conservative ideology, and it is up to people on the actual left to realize their party is no longer concerned with their ideology, and start figuring things out from there.